Spirit Of Samba presents:Briannes Sweet 16! Miss Brasil Usa in Orlando 2015 with special guest. Spirit of Samba. Spirit Of Samba and Sambatur rocked the party! Brazilian Samba Dancers from Rio de Janeiro Samba Schools. Muse Of Carnival in Rio de Janeiro. Carnival Party at Majestic Resort-Punta Cana. Carnival parade in Rio de Janeiro. Show in Boca Raton with Brazilian Beat show. The Australian track and field team Olympics Opening Ceremony. Beautiful Miss USA-Ericka Dunlap is Spirit Of Samba. A celebration of Carnival At 41St Anual Awards Gala. Wedding at Bella Collina Venue. Pool party at the Hollander Hotel. Brazilian Day Party in Sarasota. You are the star of your event! New Years EVE at Cuba Libre. Spirit Of Samba Team at Lake Eola event . Event with the famous Brazilian Soccer player Ronaldo. You are the star of our show! SOS is a professional entertainment group that will bring the highest standard performance with glamour, excitement & an electric atmosphere to your event. We provide sophisticate shows with beautiful costumes, choreography and guest interaction. We provide a vast entertainment directory including Brazilian Samba Dancers, Belly dancers, Bollywood Dancers, Fire Dancers, Burlesque,Flamenco Dancers, Stilt walkers and much more. We have a fun hora loca which normally opens the dance flor and brings everybody to dance! Our goal is to put a smile on your face by providing an act that your guests will be talking about long after your event is over. Hired SOS for my wedding reception, super professional, on time and got everybody moving from the 3 year old flower girl to my 90 year old grandma. Michelle was always a text message away! Fantastic team! Will most definitely recommend them for any party! It was a pleasure to be part of your special moment ! Beautiful Alejandra! Wow what an amazing talent you have! Thank you for making my hubby’s birthday party/ fellas night a memorable one! I was very impressed with your skills. You were very professional, approachable, friendly, warm and talented. You were one of the top performers at the party. You were an exceptional addition to the event! Thank you! Shoutout to you Michelle ! you really delivered everything you promised. They party is over but those priceless memories will Last Forever. Spirit Of Samba are committed to what we have promised to our clients . We are glad you guys had a great time! Our performers are very professional and TOP! Of their class! We work with the best dancers, performers, and entertainers . 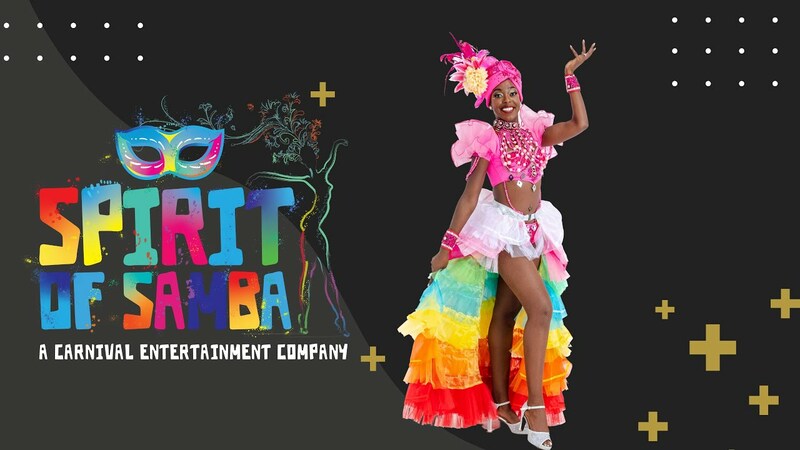 Thank you again for contacting Spirit Of Samba Entertainment . Great Entertainment for Social Events! We had the privilege of having the Spirit of Samba ladies out for a Special Olympic Opening Ceremony in celebration for RIO 2016. They were professional, super sweet, had wonderful stage presence, and was great with the audience! Would recommend them to anyone. I absolutely loved working with Valeria from Spirit of Samba!! From the very beginning she was very courteous and understanding of what I was looking for for my mom's 50th Birthday Party. I had three dancers at the party and they certainly made the party a hit. Everyone's still talking about it :) I would definitely recommend this company and I'm looking forward to working with them for any future events. Loved you Ladies!!! SOS was easy to work with and gave an excellent performance. We hired two Samba dancers. As a smaller group of just over 50, they really helped get the crowd moving and everyone was on the dance floor during our Hora Loca. Thanks again for your service. EXCELLENT! Highly recommend hiring these dancers. The talent, charisma and professionalism of these ladies is incredible. Communicating with them was extremely easy and once they arrived at the party they were fantastic. They entertained every single person in the party from the youngest to the oldest. My guest can't stop talking about them and how incredible they are. They were able to adapt to our environment. The ladies bring their own music but they were also able to dance to our music, creating a carnival like atmosphere. WE LOVED having them in our party! Thank you so much for booking SOS for your father's birthday celebration. You have a beautiful family I loved you little sister, she's adorable. Thank for the delicious food and the aguardente from Colombia. This girls are awesome!!! I hired them for my 30 th birthday party! It was amazing! They are very puntual and responsable! They even went out of there way to make my guest and me have an expectacular night!!!!! Jen it was a joy to be part of this amazing & fun celebration. What a party!!! Thank you for the feedback! I had the pleasure of hiring these three beautiful ladies for my daughter's sweet 16. I also was able to take a few samba classes with them as well. They really are the real deal! Professional, gorgeous and all in all talented. I would recommend them to anyone. All my guest could not stop talking about how amazing their performance was. Thank you so much spirit of samba for making briannes party a super success! Our Family had the Honor to have one member of Spirit Of Samba for my Daughter Quinceaños. Samba Dancer Michelle Bailey, Thank you for making my beautiful Daughter special day. More Amazing and Outstanding. You and Spirit Of Samba are truly Profesional. From all our Familia Gracias.